The Morris County Board of Freeholders asks all county residents to join with them today in remembrance of all 9/11 victims and those exceptionally brave men and women who risked their lives and worked so tirelessly 16 years ago in rescue efforts in New York, Arlington, and Shanksville, Pa.
FDNY’s John Fila speaks at the Morris County 9/11 Remembrance, as the freeholders listen. World Trace Center steel beams are in the background as part of the Morris County September 11th Memorial. 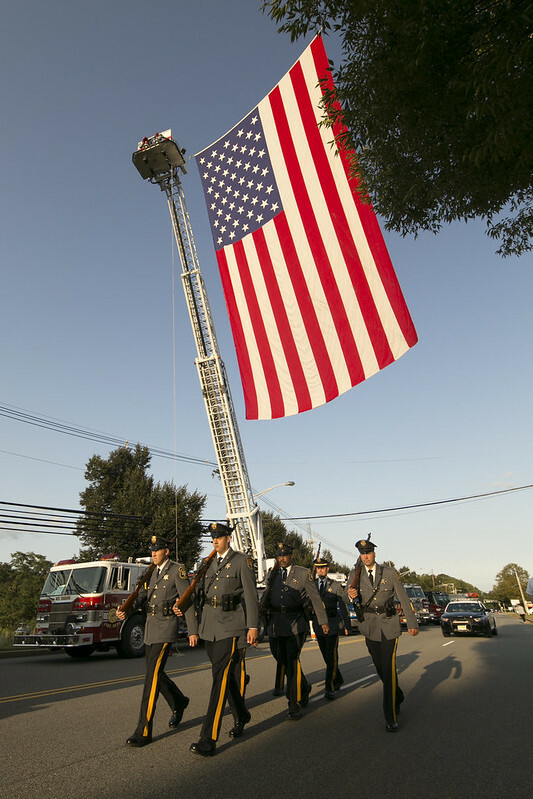 A special 9/11 Remembrance was held last night at the Morris County September 11th Memorial in Parsippany. FDNY’s John Fila, of Engine 15, Battalion 9, Ladder 4 – and a Boonton native — spoke of the heartbreak of losing 15 colleagues as they attempted rescues in New York’s Twin Towers. Most important, he urged that we never forget what occurred that day, and always hold a place in our hearts for those who perished. Officials, first responders and residents observed the 16th anniversary of the September 11, 2001 terrorist attacks against our nation at the Morris County Remembers 9/11 Service on Sunday, Sept. 10, at the county’s memorial on Hanover Avenue. The event was sponsored by the Morris County board of Freeholders. Today, many of the families of victims have gathered in New York and Virginia, and Pennsylvania, and at sites across our own county to remember 9/11. “September 11, 2001 was a beautiful late summer Tuesday that began with golden sunshine and a clear blue sky. But, before it ended, the day now known simply as 9/11 had become one of our nation’s darkest days. Thousands of others were injured. Countless lives were forever affected. In years that have passed since that September 11th morning, we have come together each year on that date to mourn for the loss of innocent life … to show our support for police, firefighters, EMTS, rescue workers and the many people who risked their own lives that day to assist others. This evening, 16 years later, we assemble again. Yes, we still mourn those who were so suddenly taken from us, but our goal tonight is to come together – not to reopen wounds – but to show the families of the victims…some of whom are with us this evening… that we have not forgotten. By doing so, we repeatedly demonstrate to those who tried to tear this nation apart that we ARE united. And we do so tonight in front of this powerful Memorial that includes three steel sections of the World Trade Center that we can touch, pieces of United Flight #93 and soil from the Pentagon. Officials, first responders and residents observe the 16th anniversary of the September 11, 2001 terrorist attacks against our nation at the Morris County Remembers 9/11 Service on Sunday, Sept. 10, 2017, at the county’s memorial on Hanover Avenue. The event is sponsored by the Morris County board of Freeholders. The concrete blocks at the base of the steel signify our foundations – the things that are truly important in our lives – our family, our faith, our relationships and our community. The water surrounding the Memorial is a symbol of healing and rebirth, and the recurring circular forms we see throughout the Memorial represent the continuance of life. There are other, more evident symbols that call out to us from this Memorial. The plaques around its circular base are inscribed with the names of the 64 Morris County residents who lost their lives 16 years ago. The ruby-colored brick pavers that have been placed around the outside of the Memorial to honor the memory of all who were lost on September 11, 2001.